Pay Day Classic Slot Guide & Review - Casino Answers! 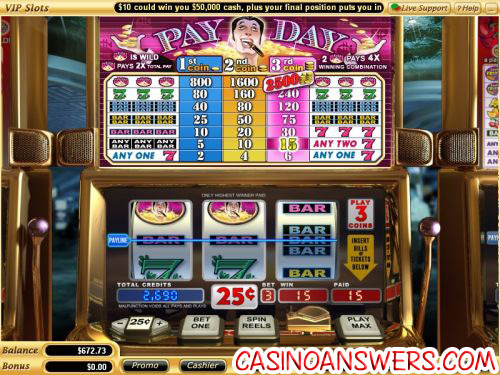 Pay Day is a 3-reel, 1-line classic slot machine developed by Vegas Technology, featuring wilds and multipliers. You can play the Pay Day slot machine at US-friendly online casinos VIP Slots Casino and Online Vegas Casino. To play Pay Day, set your coin size at $0.10, $0.25, $0.50, $1, $5 or $10. Then, select how many coins you wish to play using “Bet One” (up to three) and hit the “Spin Reels” button. Play the maximum three-coin bet using the “Play Max” button. A three-coin bet is recommended, as the top jackpot is worth proportionately more at three coins than two. The smallest bet you can make on the Pay Day slot is a dime, while the largest possible bet you can make is $30 per spin. The top jackpot on the Pay Day slot is the Pay Day wild symbol. Three Pay Day symbols on the center payline are worth 2500 coins on a 3-coin bet. The Pay Day symbol will substitute for all other symbols to complete winning combinations. One Pay Day symbol will multiply your winnings by two. Two symbols will multiply your winnings by four. Payouts on the Pay Day classic slot machine are (1/2/3 coin payouts in parenthesis): 1 of any Seven symbol (2/4/6), any 3 Bar symbols (5/10/15), any 2 Seven symbols (5/10/15), 3 Single Bar symbols (10/20/30), 3 Pink Seven symbols (10/20/30), 3 Double Bar symbols (25/50/75), 3 Triple Bar symbols (40/80/120), 3 Green Seven symbols (80/160/240), 3 Pay Day symbols (800/1600/2500). There are nine winning combinations on the Pay Day slot game. Take advantage of the 100% signup bonus up to $777 over your first three deposits to play the Pay Day slot machine at VIP Slots Casino! Are US slots players allowed to play the Pay Day classic slot game for real money? Yes, players who are based in the United States of American are certainly welcome to play the Pay Day traditional slot machine at all Vegas Tech online casinos. Two of our favourite casinos that use the Vegas Tech casino software are VIP Slots Casino and Online Vegas Casino. Is Pay Day a progressive jackpot slot? No, Pay Day only has a top fixed jackpot of 2500 coins. However, Vegas Tech casinos such as VIP Slots Casino and Online Vegas Casino offer some progressive jackpot slot games for USA-based slots players, including Red, White & Win, Mega Money Mine, Win, Place or Show and Pay Dirt (which you may be thinking of). How can a Macintosh user play the Pay Day slot machine? VIP Slots Casino offers an Instant Play Flash version of their casino, but at this time, Pay Day is not one of the games available. Instead, we recommend non-US Mac users try out the downloadable Mac software at Tower Gaming Casino. Can I play the Pay Day slot game for free? Yes, all Vegas Tech casinos offer a “practice play” or “play for fun” option where you can try out every single one of their games (excluding progressive jackpot games) before you make a deposit. To try Pay Day out for free, download VIP Slots Casino. For more details on VIP Slots Casino, you can read our review of VIP Slots.